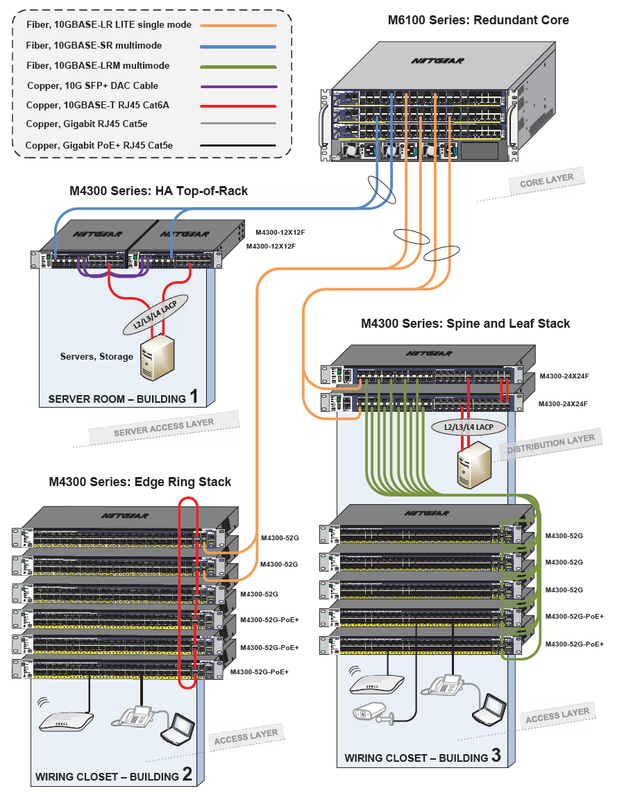 The NETGEAR® M4300 Stackable Switch Series delivers L2/L3/L4 and IPv4/IPv6 cost-effective services for mid-enterprise edge and SMB core deployments with unrivalled ease of use: 10/40 Gigabit models can seamlessly stack with 1 Gigabit models within the series, enabling spine and leaf line-rate stacking topologies. Non-stop forwarding (NSF) virtual chassis architectures provide advanced High Availability (HA) with hitless failover across the stack. Dual redundant, modular power supplies equipping full width models contribute to business continuity management. Layer 3 feature set includes static, dynamic and policy-based routing – as standard. Perfect for wireless access, unified communications and IP video, the NETGEAR M4300 Switch Series is also ready for the future, with Software-defined Network (SDN) and OpenFlow 1.3 enabled for your network. ProSAFE® M4300 Stackable L3 Managed Switch Series comes with 40G, 10G and 1G models in a variety of form factors including PoE+ full provisioning. SDN-ready with OpenFlow 1.3, M4300 Switch Series delivers IPv4/IPv6 rich services for mid-enterprise edge and SMB core with mixed stacking between 40-, 10- and 1-Gigabit models. Layer 3 feature set includes static and policy-based routing, RIP, VRRP, OSPF, and PIM dynamic routing. M4300 is ideal for server aggregation, wireless access, unified communications and Video-over-IP. * This product comes with a limited warranty that is valid only if purchased from a NETGEAR authorized reseller and modifications to product may void the warranty; covers hardware, fans and internal power supplies - not software or external power supplies . Lifetime technical support includes basic phone support for 90 days from purchase date and lifetime online chat support when purchased from a NETGEAR authorized reseller.